Known as The Mother Road, world famous Route 66 is still traveled by thousands each year in search of simplier times. Was known as the Will Rogers Highway for a short time. 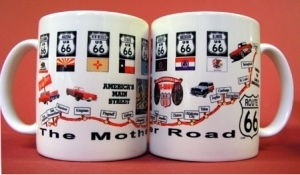 Colorful coffee mug with images of historic Route 66, The Mother Road, along with map autos and signs. At one time Route 66 was known as The Will Rogers Highway. 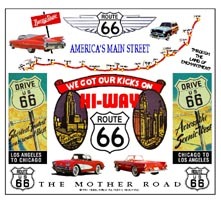 Colorful mouse pad with images of historic Route 66, The Mother Road, along with a map autos and signs. At one time Route 66 was known as The Will Rogers Highway. 6 inch x 6 inch square tin Route 66 logo sign.